By Laura Czerniewicz, the Director of the Centre for Innovation in Learning and Teaching at the University of Cape Town, South Africa. She is the co-Principal Investigator of the Unbundled University research project. This article was first printed in EDUCAUSE Review 53, no. 6 (November/December 2018). © 2018 Laura Czerniewicz. The text of this article is licensed under the Creative Commons Attribution 4.0 International License. Unbundling and rebundling are terms that have become more widespread in the last few years, in articles in the Chronicle of Higher Education, Forbes, Huffington Post, and EDUCAUSE Review.1 But these terms do not come from higher education; their original source is the banking industry. An online search for unbundling and rebundling today will lead to results not only in banking but also in the computer industry, legal services, and of course, the music industry. Relatively recently, these concepts have become realities in higher education—at a time when state funding for education is decreasing, higher education tuitions are increasing in many parts of the world, and student numbers and demographics are changing as well. Very simply, I'm using the term unbundling to mean the process of disaggregating educational provision into its component parts, very often with external actors.2 And I'm using the term rebundling to mean the reaggregation of those parts into new components and models. Both are happening in different parts of college and university education, and in different parts of the degree path, in every dimension and aspect—creating an extraordinarily complicated environment in an educational sector that is already in a state of disequilibrium. Unbundling doesn't simply happen. Aspects of the higher education experience disaggregate and fragment, and then they get re-created—rebundled—in different forms. And it's the re-creating that is especially of interest. What does this all look like? Let's start with what's happening in the area of disciplinary knowledge: curriculum; flexible pathways; resources; and academic expertise. Curriculum is at the heart of what we do in teaching and learning in higher education. Traditional, residential higher education institutions offer formal, credit-bearing curricula with lectures, tutorials, and seminars. They also offer semi-formal forms of delivery such as short courses as well as non-formal offerings such as summer school or public lectures. Recently there has been expansion into that non-formal space, especially with massive open online courses (MOOCs). Five years ago, MOOCs were completely in the non-formal space, but this has changed. What's particularly interesting now is the intersection between non-formal, semi-formal, and formal. This interface at the blurring of boundaries is where innovative forms of access and new models of provision are emerging. What is also happening in the online sphere is that the different dimensions of teaching courses and programs are separating out or disaggregating. These dimensions comprise various granular components: e-readiness; program-level planning; course design and development; course delivery; course student support; course and program evaluation; and course maintenance/updates. Every single component within those dimensions can be offered by a different provider or vendor as a single service or as multi-services. This has serious implications for platforms, for practices, and for assumptions about students' abilities. This separation of the different dimensions is adding to the complicated nature of the student experience and to the assumptions we make about the students who will have to cope in an increasingly blended and online system. Students will need complex digital literacies to negotiate these new forms of curriculum provision. The curriculum landscape is deeply entrenched and is very slow to change.3 The critical shift from informal to formal involves boundary-crossing and fuzziness. We have to ask ourselves: Whose interests will these new forms of curriculum provision serve? Which kinds of students are going to benefit? In which places? For what types of institutions? And at the same time that how the curriculum is provided is changing, there is a great deal of work still going on to change the nature—the what, the content—of the curriculum. These issues include transformation and decolonization, surfacing the student voice as well as humanizing the curriculum experience. Teaching and learning resources are also being unbundled. They're becoming more granular, multifaceted, and multimodal. They're becoming more complex. They're becoming more modular. Resources fall across axes of different kinds of intellectual property regimes and governance structures: digital versus analog; full copyright versus open licensing. Depending on those intellectual frameworks, how the unbundling and the rebundling happens will be different. We're seeing different experiments and models for resource provision, including the subscription model: access while you pay. Proprietary textbook options now include—an "all-in-one" digital subscription. Users pay a license and can get everything (whatever that means) for as long as they pay. When they stop paying, access stops, unlike with traditional models of ownership.4 So Netflix comes to higher education, and students no longer own their own textbooks. This kind of rebundling offers more for the duration but works only for those who can keep paying. There are also original resource innovations using commons models based on open licenses, enabling ongoing free use for all, often with adaptation rights too.5 A popular approach in this space is the freemium model—that is, something that is partially free and partially open and partially paid for. This model is usually promoted as something of great value and of great good, but we should ask: Is it? And when is it advantageous? To whose advantage is a freemium model? Who can afford to pay? Is it unfair to offer something that is only partially free—fully available only to those who can pay? Auditing and free MOOCs are on their way out. When a participant joins a MOOC today, it's really quite an effort to participate in the free version (when a free version is still available). There are so many moments to pay that the participant needs to be aware that it's actually possible to audit the MOOC and participate for free. Is the promise of free access dead in the MOOC sphere? What are the implications of the shift to a licensing model? This signal from an "open" approach to one similar to the entertainment or music model of access—with access available only while a user pays—raises equity concerns for those who argue for MOOCS as democratic, public-interest models of innovations in provision. This raises an interesting dilemma in the MOOC sphere. Some providers offer full financial aid. So there's no auditing, and participants can do everything as well as get a certificate. That's a good thing, isn't it? But what about the politics of having to ask for access, of having to declare poverty? This uncovers the complexities of charity; is receiving financial aid a preferable solution for those who are trying to gain access and be sure of full participation? One of the important promises of an unbundled higher education environment is that of flexible pathways. Ease of access—ease of movement, portability, mobility—is much touted. This can be seen in the formal sphere, for example in initiatives where students can exchange courses and move within the sector: "California Community Colleges, the nation's largest system with 113 institutions," launched a course exchange "so students at one campus can take classes online at another if those courses aren't available on their home turf." California began its Online Education Initiative in late 2013, including "building an online course exchange and creating additional services like counseling to support students in online classes. "6 Flexible pathways enacted. Further flexibility is exemplified by MOOCs and microcredentials (such as nanodegrees), which MOOC providers are developing: these enable students to collect credits that will take them from the non-formal into formal spheres. Their credits can be counted so that they don't have to pay as much and don't have to take all of the courses in the formal sector. This is a real opportunity and a significant shift away from the way things have always been done, especially for expensive postgraduate programs. Until you look at the numbers. In one example, 323 people out of 34,086 were able to take advantage of MOOC credits.7 Is that really a form of access? On the one hand it is, because 323 people gained access—people who wouldn't have gained access to a program that might otherwise have had 20 students. On the other hand, this is an incredibly small fraction: 1 percent. How widespread will this become? It is not clear yet, which is why this is such an exciting and emergent space. All of this raises questions not just about access but about success. Access is only entrance—allowing someone to join the party, to get into the system. What about succeeding in the system? How are students going to succeed in the college/university of the future with hybrid online/non-online courses centered around students with credits accruing from multiple schools, in alternating periods of attendance and absence?8 How are students going to have coherent educational experiences? What kinds of cultural capital do they need to negotiate such an experience? These are the harder questions to answer. Both the academic expert and academic expertise are becoming unbundled as well, giving rise to new roles, including the rise of the para-academic.9 This is happening at the same time that academia itself is going part-time and becoming less secure.10 We're seeing the growth of the academic precariat, with all the worrying implications that has not only for a decent and humane working life for academics but also for robust knowledge production and dissemination and for the coherence of the student experience. Finally, does the automation of the professions apply to academia?11 I think it does. Roles and activities are already being transformed—humans can be replaced by chatbots offering robotic tutoring, and the holy grail of automated marking is being pursued as digitally mediated rebundled teaching is reimagined. My question here is: In an age of adaptive learning, how will an increasingly fragmented, dispersed, and precarious academic body share knowledge with and enable a coherent, caring, and supportive learning experience to all students? A college/university education affords the opportunities of support, credentials, and networks. In addition, support is being automated. Learning analytics and adaptive learning promise to automate support and to replace "pastoral care." But the dangers of automated support can be severe. The risk is a differentiated system in which the poor will have the support of machines and algorithms while the rich will have face-to-face and paid support. Is there an alternative? How can the affordances of new technologies be exploited and leveraged to ensure appropriate, affordable, and caring support for all? Credentials and new forms of credentialing are central to how unbundling and rebundling are being enacted. As Sean Gallagher notes: "The traditional boundaries are blurring between professional development, occupational credentialing and formal higher education. "17 We are seeing the intensification of new forms of agreement around competence and status, including not only credentials but also micro-credentials, "nano"-degrees, and badges (digital badges, open badges). This may even lead to omitting the college/university altogether as educators and organizations collaborate and use their own forms of credentials. Finally, a third opportunity involves social networks and social capital. Residential colleges and universities are sites of peer interaction and the development of social networks and social capital. What will the potential differentiation of the system mean for how social capital is imbued and gained? Will the elite residential institutions be the ones to inculcate and enable the networks of social capital? How will students who are outside that system gain social capital? Can valuable networks be built in rebundled digitized environments? Or will "bricks for the rich and clicks for the poor" mean that they will be effectively locked out? What does it mean to be a graduate in this environment in which "graduateness" is a brand? For many employers, what students have studied is not the issue; many employers are more concerned with where students have studied. The brand of the institution signals a particular kind of graduate. Attributes and literacies are assumed as a result of co-curricular experiences. Students and parents know this. So what does an increasingly object-oriented, competency-based unbundled higher education mean for the notion of graduateness? Online is now close to mainstream. In the United States, more than 30 percent of higher education students are enrolled in at least one online course.19 In our research, one senior academic stated: "I think online is the future of universities. Because of the financial strain, because of the fact that we live in a global community. Perish the thought but I think that is going to happen. "20 Willingly or unwillingly, we're headed that way. The online mode is also creating new functions and capabilities. Online courses require different and often expensive types of work including professional development, technologies, design course/program specifications, instructional design, learning materials, student identity verification, assessments, accessibility, and accreditation. And online is producing not only new market opportunities and new enabler companies but also new relationships: with private companies as partners or service providers and through both outsourcing and insourcing. The online mode is creating a differentiated system, with diversified offerings for different groups. For example, the University of Pennsylvania's Wharton School offers an MBA degree, in various formats. In an analysis of 875,000 students in 9 MOOCs, a higher percentage of foreign-born students, of unemployed students, and of underrepresented minorities enroll through the MOOCs.21 Depending on your view, that is either an increase in access or an increase in marginalization, representing a differentiated system that is keeping those students out of the mainstream experience. Which is it? The answer is not straightforward. Indeed, online courses are not always favored by those for whom those good intentions are offered. A British Council study of Syrian refugees found that they believed that the people who taught those online courses were not as good as face-to-face teachers. And they were, once again, concerned with the matter of accreditation.23 The online space is clearly rife with complex and profound issues raised by equity and by increasingly pervasive private/public partnerships: new and changing roles and responsibilities; ownership of the academic project; academic identity and responsibility; the impact of commercial values on teaching and learning; as well as emergent values needing close interrogation. Place is being replaced by platform, by new learning environments. What does this mean for the student experience? What kind of identity and community is possible in cyberspace? What is a sense of place in the online sphere? Technology and market liberalization thus open up opportunities to pursue the broader conceptual opportunity of the "borderless" student population. With the intense competition for capable moneyed students from everywhere in the world, and with the options for these students to apply to any provider anywhere, where does that leave those without financial resources? Who is responsible for everyone else? Is the local college or university left to provide education for the have-nots while the haves go online to more prestigious educational providers from other countries? Or will rebundling see the elite remain residential while the rest go online locally? Unbundling and Rebundling: Opportunity or Threat? The first problem when debating whether unbundling and rebundling are opportunities or threats is that the associated words themselves have different meanings depending on the agenda being promoted. For example, flexibility can mean convenient and mobile, but it can also mean incoherent, fragmented, and difficult for those without cultural capital. Sharing can mean generosity, openness, and opportunity, but the sharing economy is known to be exploitative. It's a gig economy. How could that sharing economy be appropriate in higher education? There are indications that this is already a danger of a disjointed unbundled higher education learning experience. Indeed, the notion of a value propositionis contested. Are we talking about a return on investment, or are we talking about the creation of social citizenship? These terms are all semantic bleaching. The unbundling/rebundling debate speaks to the battle for the soul of the college/university. Are higher education institutions going to become businesses specializing in preparing people to work in businesses? Or are they going to be places that create citizens with humane perspectives and critical stances serving the public interest? This is the tension that is being manifest in the trends noted above. The unbundling/rebundling debate also speaks to the relationship between the market, the state, and the commons. It is essential to consider rebundling in the light of the possibilities of the commons. 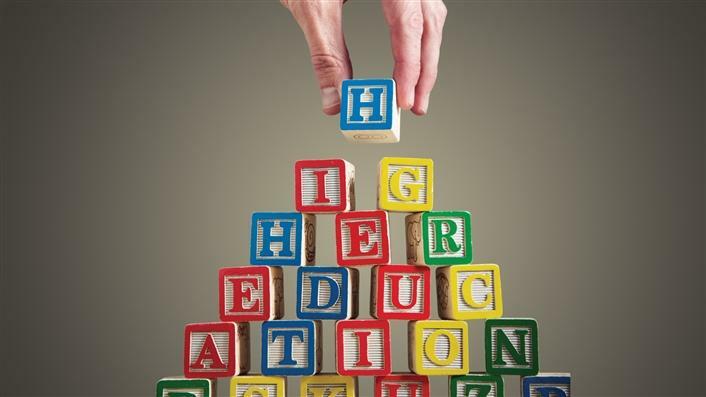 At the moment, arguably, the marketized approach to higher education—or social imaginary—is dominant. What has happened is that the market-led approaches have recognized the opportunities that unbundling and rebundling provide and have found ways to monetize every single aspect listed so far, including graduate capabilities, support, credentials, networks, disciplinary knowledge, opportunities, experience, graduateness, mode, place, curriculum, learning pathways, resources, and academic expertise. This raises some critical questions. Who's doing this monetizing? Why? For what purpose? Which types of knowledge are being valued? What is considered "valuable" in higher education? What is the meaning of the academic "brand"? Who is regulating and shaping those markets? And why is this all so urgent now? A final consideration is the role and responsibility of the state. There has always been a relationship between the state and the market. There's nothing new about that relationship. What is new is the question of who has control of that role and relationship. The pendulum has swung. Who determines the priorities for market behavior? Who defines the objectives? Who makes the decisions? Who regulates and shapes? What is gained, and what is lost—and by whom? Higher education is a hybrid ecology. Other possibilities for shaping provision include the model of the commons. The idea of the commons places knowledge and educators as knowledge producers in charge at the center, in a shared understanding. This approach foregrounds co-creation and participation. It develops governance mechanisms premised on shared resources. And it shifts the discourse from a market-led higher education knowledge economy to an open, collaborative, learning-led knowledge society. How can the market be regulated in unequal contexts to serve the public good? I believe the answer is through appropriating commons approaches to higher education and through reasserting the role of the state, which has been systematically underfunding the higher education sector. The state has too often abdicated its role as regulator and ensurer of higher education as a public good. It is the state that needs to mediate and shape the possibilities of the market and the role of the private nature of higher education. Despite all the challenges, it is the state that has the primary responsibility to ensure that redress, successful participation, and disadvantage are addressed. If unbundling and rebundling are to serve the needs of a knowledge society for the good of all, how can the state enable the requirements of socially responsible public education for a democratic citizenship? It is not inevitable that profit making will determine how unbundling and rebundling in higher education will play out. The situation is dynamic, in flux, and highly contested; it is being negotiated and renegotiated right now. Unbundling and rebundling in teaching and learning are about power and contestations. Emergent models and innovations are appropriated by competing discourses and agendas. Is it a problem or a solution? As part of the problem, unbundling and rebundling may serve the interests of the few rather than the many and may serve the private good at the expense of the public good. The risks are many, including fragmentation in higher education, leading to an incoherent student experience, and monopolization of the higher education sector by a few companies, just as has happened in other sectors. But I'd like to conclude on a hopeful note. Unbundling and rebundling can be part of the solution and can offer opportunities for reasonable and affordable access and education for all. Unbundling and rebundling are opening spaces, relationships, and opportunities that did not exist even five years ago. These processes can be harnessed and utilized for the good. We need to critically engage with these issues to ensure that the new possibilities of provision for teaching and learning can be fully exploited for democratic ends for all.